I had to stop and take a picture, because I’ve never seen a part of a bus donated! And because I needed an air condition too, and I thought maybe this may be my answer. But on a serious note, I thought the plaque was worth commenting. 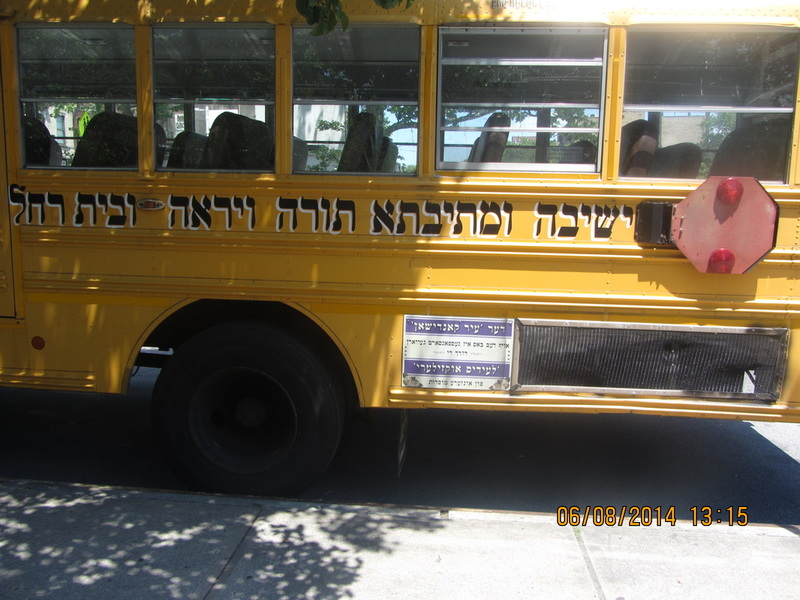 It is written entirely in Yiddish, unlike most donation signs that are written in at least some Hebrew. Where I’d expect to see the Hebrew word nadev for donate, we have sponsored transliterated in Yiddish. I’d venture to theorize that the reason it is a mix of Yiddish and English and not Hebrew is because it was sponsored by women. This reflects the very gendered language in the Hasidic community, where men read Hebrew fluently but little English, and women only speak Yiddish and English.